The temple is located on the bank of the river Kaveri, 7 kms from Kumbakonam. 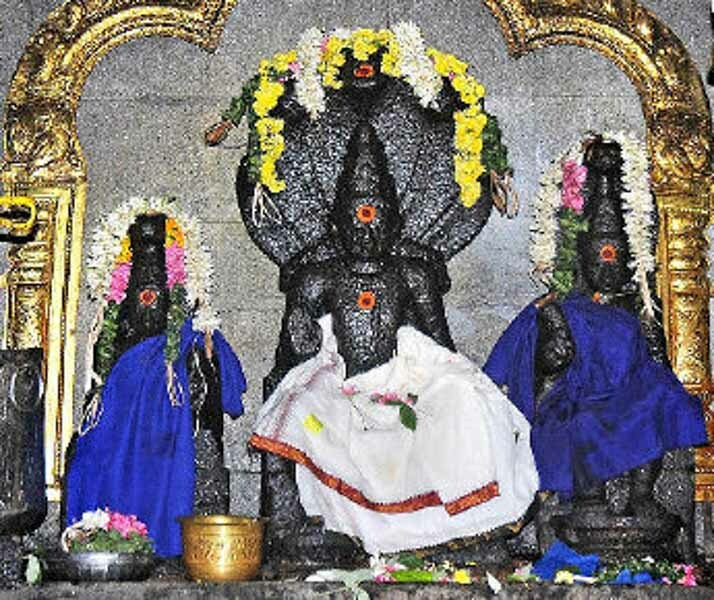 This is known to be the sthalam for the presiding deity Raaghu (serpent), one of the nava grahas. 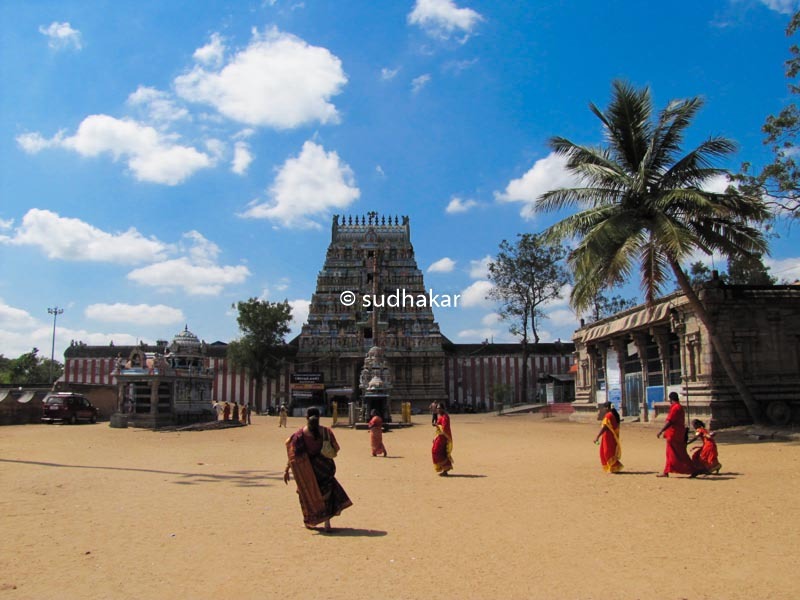 However, the main deity in the temple is that of lord Shiva known here as Naganathaswamy. The serpents of the divine world , Adishesha, Takshaka and Karkotaga, worshipped Shiva at this place, hence the name "Tirunageswaram" ( Naga means Cobra). The temple is another masterpiece exhibiting the Chola style of architecture. History states that it has been built by Aditya Chola I in 10th century A.D. Later rulers have modified the temple with their own additions.There are four gopurams and a surrounding compound wall. In the third praharam, there is a nandavanam (flower garden) on the northern side. The Ganapathy shrine was installed by the great saint Sadasiva Brahmendra along with a Ganapathy yantra. The second praharam houses the Raaghu shrine in the South-West Corner where Sri Raaghu Bagavan can be seen with his two consorts Nagavalli and Nagakanni. The path leading to the main sanctum in the second praharam has a hall has hundreds of pillars with beautiful carvings of yalis. As per legend, sage Bringhi used to worship only Shiva. Angered at his attitude, Parvathy went on a severe penance asking for a boon wanting half her body as Shiva ( Artha Nareeswarar). Pleased with her penanace, lord granted her wish. Hence we can see the Arthanareeswar in this temple. Apart from this, thayar Girigujambigai, Lakshmi and Saraswathy are seen together in the same sannithi.It is beleived that praying here will bring wealth and prosperity to the devotees. During the month of Markazhi ( Dec-Jan),the sanctum is closed for public for 45 days and pooja are performed only to the curtain of the sanctum. Next to this sannithi, there is a sannithi for Ganapathy and Raaghu as 'yoga Raaghu'. as Raaghu is a great devotee of Shiva, he is said to have stayed here along with his consorts. According to temple inscriptions ,the ambal here is swayambu. Lord Indran is said to have done abishekam with Punugu ( a kind of fragrant scented material obtained from the Civet cat) to overcome his bad body odor due to a curse. Hence even today, no other abishekams are performed to this goddess, only the fragrant Punugu is applied twice a year. People pray here for removal of Raaghu dosha which generally affects their health, marital happiness, discontinuation in employment. It is beleived that fasting on Sundays and Fridays, and performing abhishekams during rahu kalam, offering blue vastras, offering blue flowers, offering sesame rice (ellu sadham) will please Raaghu and your rahu doshams are alleviated. During abhishekam of the idol of Raaghu in the Raaghukaalam with milk, the milk turns blue in color, which is a divine miracle and devotees throng to see this sight. 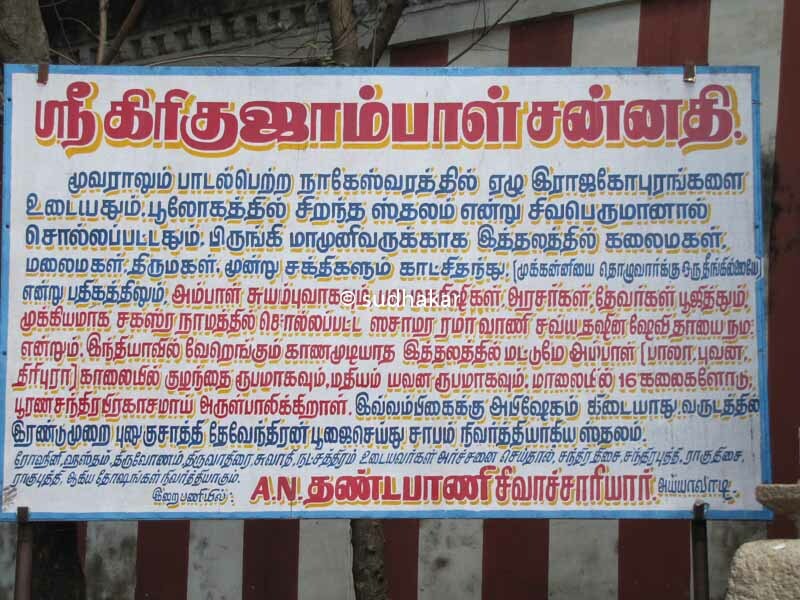 Saivaite saints Thirugnana Sambanda Swamigal , Thirunavukkarasar and Thiru Sundaramoorthy nayanar and Saiva saint Sekkizar, who wrote the sacred ' Peria Puranam ' have sung in praise of lord Shiva here, . As the temple is revered in Thevaram, it is classified as 'Paadal Petra Sthalam', one of the 276 temples that find mention in the Saiva canon, Thirumarai. Usually crowded during Raghu kalams. There is a separate calendar for the Raaghu Abhishekam that is performed twice a day at 11:30 a.m and 5:30 p.m. and additionally during the rahu kalam of that day. On every occasion of Raaghu moving to next rasi once in one and half years special Abishekam with Homam are performed and on all the three days Raaghu Bagavan is taken in procession in Sesha Vahaham . People come and have darsan of the Bagavan during this period. This place being the most sacred one for Sekkizhar who wrote Peria Purana , Sekkizhar Vaikasi Poosa celebrations are being held in a grand manner with participations of Madathipathis of Thirupanandal , Thiruvaduthurai , Kundrakkudi and Thiruvannamalai Aadeenam . Raaghu dosham ( influence of rahu) is said to cause ill health, skin ailments, problems in married life,professional life and other drawbacks in life. To absolve this devotees go on fasting on Sundays and Fridays, and perform abhishekams during rahu kalam, offer blue vastras, offer blue flowers, offer sesame rice (ellu sadham) that pleases Raaghu and rahu doshams are alleviated. Temple location It is situated in the heart of the Thirunageswaram town. Temple Timings It is normally open from 6 am –12.45pm and 4.00pm-8.30pm. Where to Stay?There are no hotels here.It is better to have Kumbakonam as your headquarters where you have plenty of budget, semi-deluxe and semi deluxe hotels. Places nearbyThe other eight Navagraha temples are in proximity to Thirunageswaram. Suriyanar Koil (for the planet Surya or Sun God), Kanjanoor (for the planet Venus or Sukran),Thirunallaru (for for the planet Saturn or Shani), Thiruvenkadu (for the planet Mercury or Budhan), Vaideeswaran koil (for the planet Mars or Sevvai), Thingalur (for the planet Moon) and Alangudi (for the Guru) Mayavaram, Kumbakonam, Mannargudi are nearby.